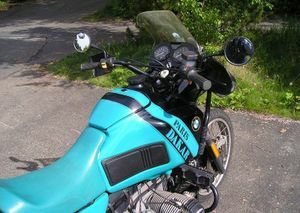 After some private entries had demonstrated the efficacy of big engines in the wide-open spaces, the BMW factory participated in the classic Paris-Dakar rally usually dominated by Japanese singles. Victories soon followed: in 1981 and 1983 for Hubert Auriol, followed by Gaston Rahier in 1984-85. It was a dramatic lesson for the Japanese and Italians. 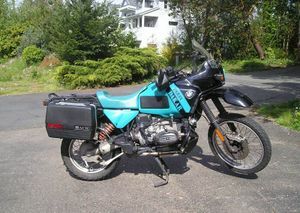 Profiting from this show of strength, in 1985 BMW launched the R80GS. (GS is for "Gelande Sport" -"cross-country sport.") It was the biggest trail bike of its day. 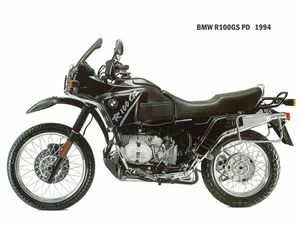 The R80GS became the R100GS in 1988, with the addition of a major innovation: Paralever. The single-arm rear suspension of R80GS received an upper arm and a reaction bar, creating a deformable girder fork. "Freezing" of the rear suspension due to the action of the driveshaft during acceleration was suppressed. 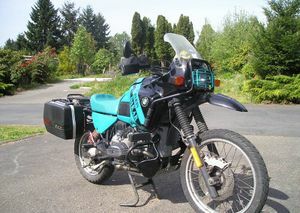 The R100GS, styled by Target Design, was sidelined in 1983 by a "Paris-Dakar" version equipped with an engine shield, a "cowcatcher" and a full fairing. Ironically, BMW long ago pulled out of African rallies under extreme pressure from the powerful "green" lobby that exists in Germany. This page was last edited on 28 November 2010, at 20:26.